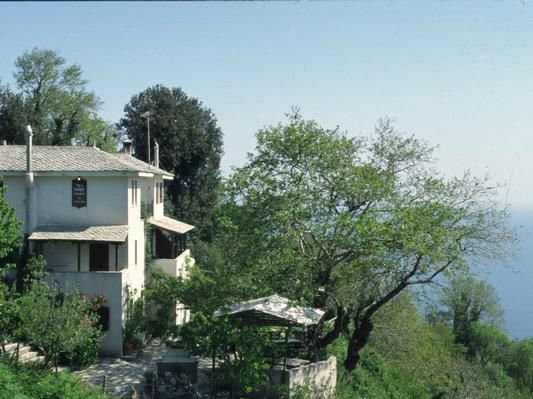 Tsagarada is one of the most touristic villages on Pelion. Set in a charming position in a lovely hillside area, overlooking the deep blue sea. It is well positioned with numerous amenties in the surrounding area to make it an enjoyable place for pleasant holidays. The stucture of the village is particularly impressing, comprising four smaller quarters. There are a lot of fascinating places around such as the colourful churches of Agios Taxiarchis, Agia Paraskevi and Agio Stefanos. MYLOPOTAMOS, a few kilometers away from Tsagarada downhill, we reach the fabulous sandy beach of Milipotamos, bustling with tourists during the summer, fascinating rocks, crystal blue sea, gentle sand and white pebbles compose an ideal setting providing a colorful spot for enjoyable holidays. Guests are spoilt for choice when it comes to beaches. Milopotamos, Fakistra, Damouchari, Papa Nero and Plaka are all only a short drive away. Georgie Villa is located in the quarter of Agia Paraskevi, just between Mylopotamos beach (2,8 km) and Fakistra (3 km). The location is total quiet in the nature. The villa is surrounded by many trees (Platanen, chestnuts etc..) and many flowers. The view from the balconies is beautiful. Shopping, Tavernen, Cafes, Post etc.. in the village center in about 2 km. The villa, constructed in accordance with the local traditional architecture offers a very relaxing stay, overlooking the Aegean Sea or the mountain of the Centaurs. Type A – Ortansia, Camelia, Gardenia 35 sqm for 2-3 persons or 2 +2 children (on the upper floor with a balcony and sea view):Ortansia, Gardenia and Camelia (35 square meters) are in the device and size equal: Each apartment is tastefully decorated and has a bedroom with double bed or 2 single beds, separate kitchen with a double sofa bed for one adult or two children, air conditioning, fireplace, heating, TV, shower / WC and balcony with garden furniture and sea views.